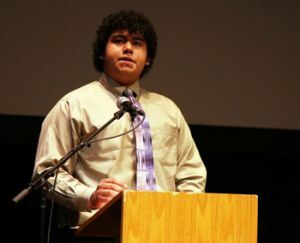 Jair Hernandez, a Goshen College sophomore, said that "Migrant farm workers really are the invisible backbone of the American agricultural system," during his speech titled "Migrant Farm Workers," that won first place in the annual Goshen College C. Henry Smith Peace Oratorical Contest on Feb. 22. Hernandez, a public relations major from Goshen, was one of six Goshen College students who spoke about a variety of peace and justice issues during the contest. Throughout his childhood, Granados traveled with his family as migrant farm workers throughout the southern United States. As he cultivated the earth, he observed the interdependence and importance of nature. 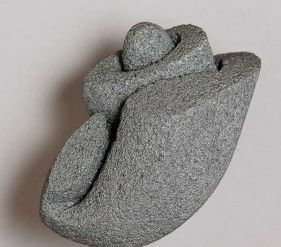 Granados is connected to his background of working with land through his use of clay as his artistic medium, and aims to create work that is organic. Through his ceramics, he tries to express his past and share the message of human sustainability. Six Goshen College students will be exploring themes of peace as they participate in the college's annual C. Henry Smith Peace Oratorical Contest. The contest, to be held in the Goshen College Umble Center on Tuesday, Feb. 22 at 7 p.m., gives students the opportunity to get involved in a peace cause as they each deliver an eight- to 10-minute extemporaneous speech. 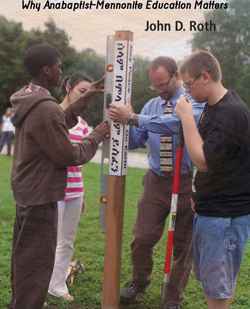 Having been involved in Mennonite education nearly his whole life -as a student, parent and professor- Goshen College Professor of History John D. Roth knows the subject of his new book, Teaching that Transforms: Why Anabaptist-Mennonite Education Matters (Herald Press, February 2011), quite intimately.